Location: In a terrace fronting the street opposite The Park. A public house built in the 2nd quarter of the C19 and shown on the 1842 Tithe map, 1871 Tremadog estate plan and 1888 Ordnance Survey. It was known as the Ship as early as 1844. A symmetrical 2-storey 3-window public house of large slate-stone blocks laid in regular courses, slate roof with 3 skylights, and stone end stacks. The central entrance has a simple portico with cast iron posts, bracketed cornice, and replacement fielded panel door. Windows are 4-pane sashes on stone sills, incorporating leaded glazing in the lower storey. The rear has replacement doors and windows and a lower gabled wing. 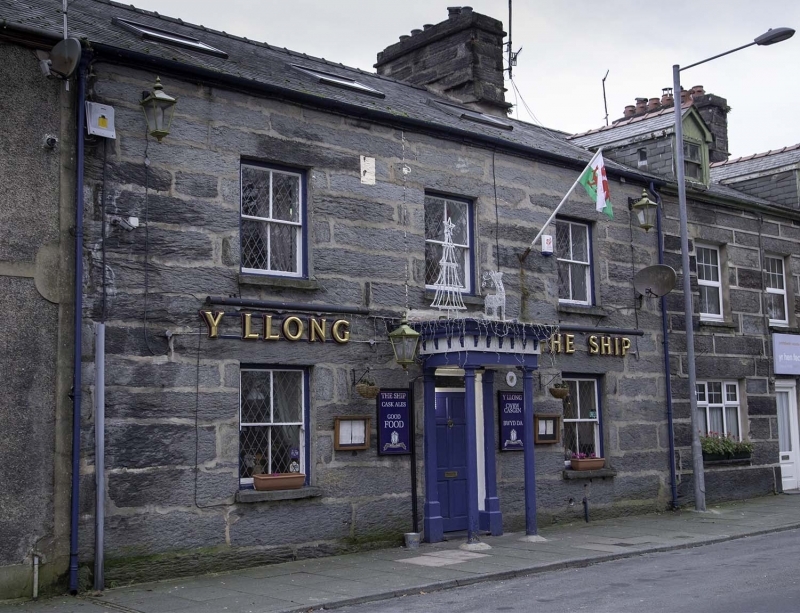 Listed for its special architectural interest as a well-preserved C19 public house notable for its distinctive use of local stone and retaining definite character close to the commercial centre of the port of Porthmadog. In a block of buildings near the N end of Lombard Street, opposite St Davids Buildings. In a row of terraced houses fronting the street. At the S end of a row of terraced houses. In a row of terraced houses near the S end of Lombard Street. In a row terraced houses at the S end of Lombard Street. In a row of terraced houses on the N side of Cornhill.